Malaga airport-Costa del Sol joins the campaign of discounts and promotions in stores, restaurants and services at the airports of the Aena network, with twenty brands that incorporate the offers in 26 locations around the airport grounds. Among the services and shops which join this promotion can be found from car rental companies at Malaga airport to restaurants and bars, not forgetting the duty free shops or Aldeasa, Cottet, Crystal Media, Superskunk o Your Fashion Store. 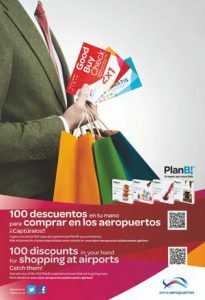 The campaign Good Buy Check, involving over 100 prestigious brands, began yesterday with a promotion on the website of Aena airports (www.aena-aeropuertos.es/descuentos-gbcheck – not working anymore), where users can download a PDF with a list of the offers in which they can choose between the offers, discounts and advantages of each facility qualifying for the campaign. There are both direct promotions (like discounts or gifts) and specific product offerings, for which it is necessary to present the printed check to enjoy the offered advantages. You can print the checks that interest you as many times as you want and enjoy the offers during its period of validity with unlimited use. These benefits are available for both passengers and companions or users who won´t fly, since among the establishments participating in the campaign there are as well those located in public areas of airports.